We would like to believe we are free to choose to do much of whatever we want to do. It's only natural, after all, since no-one wishes to be trapped by anything. However, in spite of our apparent freedom to make all the choices we make from one day to the next, our energy tells a different story. We're not necessarily as free as we'd like to believe. It would be easy to take a "big" life decision to illustrate this assertion, as an example of the relationship between our energy and the choices we make – say, getting married, moving house or accepting a job offer in Tierra del Fuego. But the big choices are only "big" because they don't happen every day and so, in truth, don't influence our energy in the same way as the frequent, apparently inconsequential, choices we make day in, day out. So, let's consider something less visible, because you do it all the time and it affects your energy and awareness on a daily basis. Let's consider the choice called, "How I Sit." Chances are, you're making it right now. You may be choosing to sit with your legs crossed, your ankles crossed or your feet apart. And, perhaps you're facing south (or have no idea what direction you're facing :), sitting up straight, leaning back or slumped on a couch. And, maybe your hands are in front of you, holding onto something or touching each other or your face as you lean across your desk to read this on your screen. "How I Sit" is a choice we make every day. A lot. Probably, without thinking much about it. After all, it's usually just a matter of habit, comfort, convenience or whatever other influences cause you to position yourself like this rather than that. So, you are, apparently, free to choose to sit as you wish... and, let's face it, what difference does it make anyway? Well, I – just to take the nearest example – choose to sit, in this moment, at this desk which faces the northeast corner of my office. My ankles are crossed, my back is straight and my tongue is centered – even your tongue is a part of "How I Sit!" After all, you may choose to touch it to the roof of your mouth or it may stick out between your teeth or perhaps it moves as you talk. And what about your eyes? What are they doing? Mine are looking at a computer screen on which there is a small window, colored violet, next to where I'm writing. Breaking down, "How I Sit," in this analytical way, seems excessively detailed, irritatingly self-conscious. Then again, I've never thought about it like this before. But, after many years of practice, I have learnt how to sit. By this, I mean that, when I sit, I align myself with the spirit of the ascending moment. To put it another way: when I sit, I – like the satellite antenna on the roof of my house – position myself to be receptive to a certain 'signal'. The reason I do this is that this signal – the "spirit of the ascending moment" – shows me how to live. Why do I need to learn how to live? Because I perceive a critical difference between, "surviving as long as possible while accumulating or enjoying whatever I want" and, "being alive." Many people share this perception. If you have it, then how much and in which ways you have it determine the nature and intensity of your personal development or spiritual practice. People on a path of personal development are, no matter how they phrase it, striving to realise the essential nature of what it is to be truly alive. One way of looking at energy is in terms of whether it is ascending or descending through your body. The more you make the choices you need to make, the more your energy ascends, which generates a higher quality of life and the many freedoms of higher awareness. Conversely, the more your energy descends, through making weakening choices, the more life is just a matter of surviving as long as possible while accumulating or enjoying (or sometimes not) whatever you want. 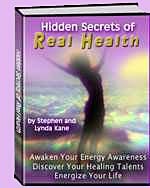 Another way to look at energy is in terms of how it enters your body. Unfortunately, there is a confusion of terms here – between, well, "energy" and "energy." The energy that ascends or descends through your body is made up of your eight life energies – the energies that enable you to exist, here and now. The energy that enters your body from outside is ki (qi or chi), the part of your life energies that you receive from your world, 24 hours a day. The other part (vitality), you get when you're born, but let's stick with ki. 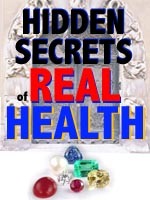 If you have read Hidden Secrets of Real Health, you'll know how different forms of ki influence your health, wealth, relationships, creativity and so on. Indeed, the art of feng shui is about almost nothing else. Whenever you make a choice about "How I Sit" (you're making a choice even when you just plonk yourself down somewhere), you put yourself into more or less alignment with the ki all around you in your environment. The more you choose, on the basis of your energy awareness, to sit in alignment with the spirit of the ascending moment, something very important happens. You cause more ki from your immediate world to enter your body via your crown – a minute vortex of energy (chakra) just above the top of your head – exactly where it must enter to be of any use to you. The less your choice is controlled by your awareness, the more your sitting position will cause ki and harmful foreign energies to enter your body via the other chakras. The problem with this is that when ki – 'good' environmental energy – enters your body the wrong way, it damages your energetic architecture – the energies that keep your body and mind functioning the way they should. Ki must be combined with your vitality in your crown to be made into your life energy. Ki entering any other way creates lesions that invariably lead to future problems in your life. It's just like eating: food is best digested when it goes in your mouth. Taking in your carrots via, say, your ears won't do you much good. 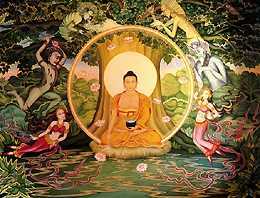 Contrary to such a 'mal-consumption' of energy, Shakyamuni Buddha, recognized exactly where to sit (under a bodhi tree), and how (in a certain posture with certain mudras), in order to receive, in the enlivening way, the energy he needed to better understand the nature of being alive. Every time you sit down you make the same choice as the Buddha – where to sit and how. And, as for the Buddha, your choices determine if you receive more of the energies you need in order to become more truly alive – the energies that generate higher awareness – or more of the harmful energies that destroy your awareness and opportunities for awakening to the essential nature of being alive. In part two of this powerful article Stephen Kane explores the nature of Karma, and the concept of following your Wyrd. What is the nature of our real needs? Why are we here? How can we make it truly real? Read part two of Being Alive: Awakening to the Spirit. Lynda and Stephen have worked together for over 15 years, having come from such disparate backgrounds as Chief Psychologist for British Airways and Director of the Institute for Advanced Health Research and Arcadia - a group focused on the cultivation of many forms of higher awareness. They now run Time for a Change at www.realhealth-online.com - a web-based entry point for anyone interested in developing the energies that determine their quality of life and their awareness of human and environmental energy.